Salt Flats and then Some! So when our 4x4 finally arrived, the lady at the travel agency said, ¨ok grab the stuff you're taking for the next 3 days, and lets go.¨ Huh? 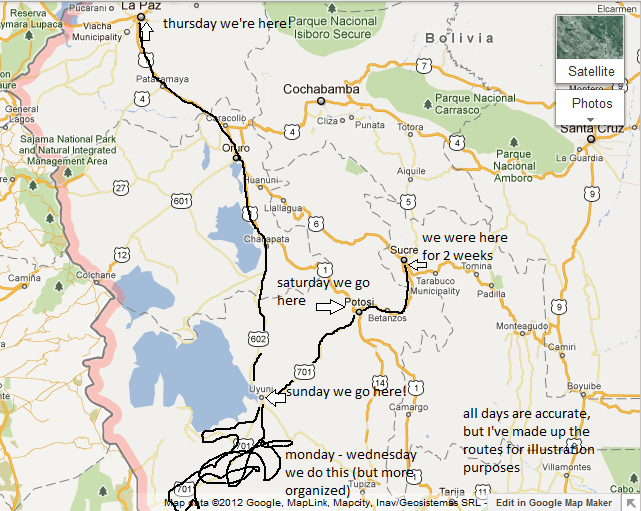 We hadn't packed, because the sister agency in Sucre had told us we were coming back that same night. Whoops! Some time later we threw our big backs on top of the 4x4 and were off to the salt flats. For now this post is sans pictures, but tomorrow I'll do my best to add a bunch because this tour is best seen, not read. It has been a lot longer than we intended since our last post, but part of the adventure includes not aways having access to reliable e-mail. (I have to say, though, that it is pretty amazing how even the smallest towns--including some of the most remote towns in the middle of nowhere Bolivia--have many internet cafes.) Also, I must apologize in advance since this post will not have pictures, in fact we will probably not be able to post pictures until Wednesday when we return to La Paz and have WiFi again. Anyway, when we last left off, we were in Sucre. It has been a busy week in Sucre. Sam and I are definitely really happy that we decided to do our language classes here. On top of staying with an amazing host family, Sucre is a beautiful city with overall great weather (like spring in Boston when we actually have spring) and many things to see. Call me ignorant, but I had a different mental picture of what our accommodations in Sucre, Bolivia would be like. I'd been told that Bolivia was the poorest country in South America, and I had seen the mud houses from the road, so needless to say I was very surprised when we entered our host family's house. The first patio when you walk in off the street (minus the tent). 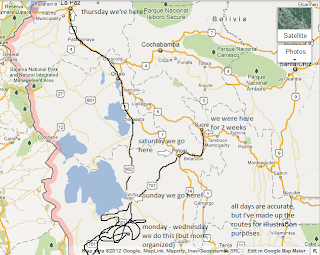 Yesterday we took a day trip to the town of Tarabuco, Bolivia, about 1 1/2 hours (on our very slow bus) outside of Sucre. On Sunday they have an incredible market where people sell their handwoven textiles (and commercially-produced ones); yarns hand-dyed in vibrant colors; knitted sweaters, ponchos, hats and gloves made out of alpaca yarn; dolls wearing traditional Bolivian clothing; instruments; some jewelry; and produce (including huge bags of coca leaves). One thing Sam and I were really looking forward to our trip (other than, of course, going on this incredible adventure together) was missing the Boston winter. However, we did not think about the weather taking extremes in the other direction. Let me tell you, Santa Cruz in January is HOT. And it does not cool down much at night (hence our need to switch to a room with AC). Coupled with the fact that there is really not much to see in Santa Cruz, we did not particularly enjoy our time in this city. Now that we're in Bolivia, I thought it appropriate to summarize the best of and worst of of Panama City. Consider this our recommendations for your travels to this city. Summertime, and the Living's Visaee..
After one last afternoon chilling at the hostel in Panama, Sam and I returned to the airport to set off for Bolivia. After breezing through check-in and security (liquids apparently undetected), Sam and I had several hours to stroll around and browse through the duty-free stores, when I asked him what he did with the money he had taken out to buy our Bolivian visas (we had been told to have crisp $20 bills to pay for it). He replied it was in his checked luggage - with all the documents he would supposedly need to get through immigration in Bolivia. It's only 6 days ago that we arrived in Panama, but tonight we're flying out of Panama City to Santa Cruz, Bolivia. First off, Happy New Years! Wishing everyone an adventurous, prosperous and healthy 2012. So what have we been up to since the 31st?